The Cross Border Giving Guides act as toolkits for new philanthropists going into countries that they are not so familiar with. The guides provide a landscape review of the country, including recommendations from experienced practitioners on the ground, relating to the regulatory framework, cultural issues, sources for information, and case studies. 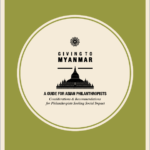 The guide for Myanmar will also inform our work for the Myanmar Community Development Fund, and help members to navigate working in the country which still has an under-developed social sector infrastructure. To generate the download link, please fill up the following form.